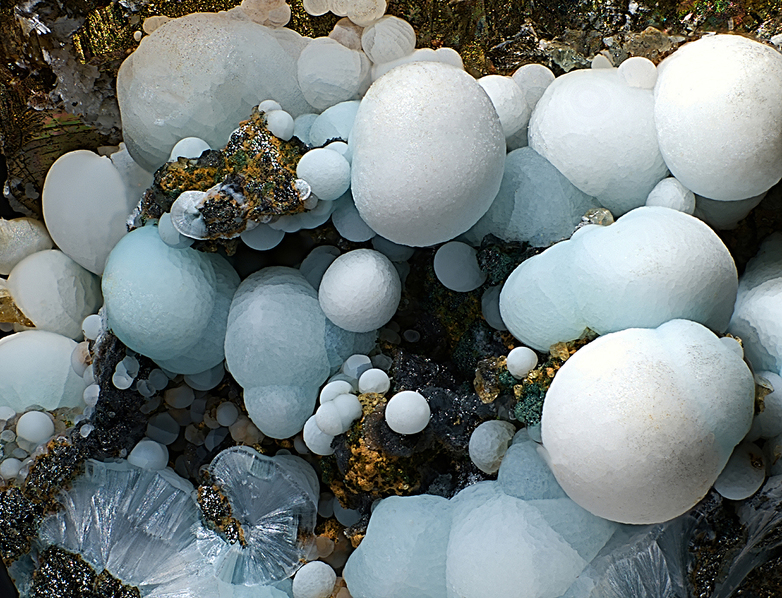 Dypingite: Mineral information, data and localities. Higher hydrate counterpart of hydromagnesite, chemically very similar to giorgiosite. Also a lower hydrate when compared to 'UM1973-06-CO:MgH'. 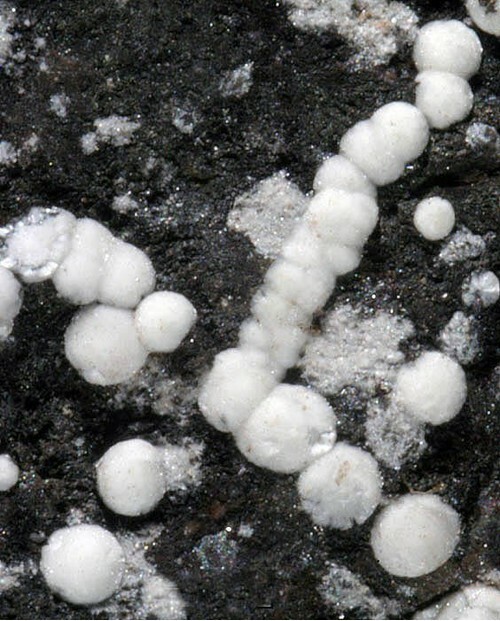 At the typelocality dypingite occurs as a surface alteration product on serpentine; it may be confused with hydromagnesite due to similarity in appearance. Forms reniform, botryoidal, oolitic or globular aggregates of radially-divergent acicular to flaky crystals, up to 0.5 mm in size. Probably monoclinic. Space group and unit cell undetermined. Natural History Museum, Oslo, Norway. Raade, G. (1970): Dypingite, a new hydrous bascic carbonate of magnesium, from Norway. American Mineralogist: 55: 1457-1465. Canavesite 35 photos of Dypingite associated with Canavesite on mindat.org. Inderite 4 photos of Dypingite associated with Inderite on mindat.org. Hydromagnesite 2 photos of Dypingite associated with Hydromagnesite on mindat.org. Hematite 2 photos of Dypingite associated with Hematite on mindat.org. Sulphur 2 photos of Dypingite associated with Sulphur on mindat.org. Szaibélyite 2 photos of Dypingite associated with Szaibélyite on mindat.org. Millerite 1 photo of Dypingite associated with Millerite on mindat.org. Siderite 1 photo of Dypingite associated with Siderite on mindat.org. Lizardite 1 photo of Dypingite associated with Lizardite on mindat.org. Magnesite 1 photo of Dypingite associated with Magnesite on mindat.org. 11.3.2 Barringtonite MgCO3 · 2H2O Tric. 11.3.6 Artinite Mg2(CO3)(OH)2 · 3H2O Mon. 11.3.7 Hydromagnesite Mg5(CO3)4(OH)2 · 4H2O Mon. Raade, G. (1970): Dypingite, a new hydrous bascic carbonate of magnesium, from Norway. American Mineralogist, 55, 1457-1465. Suzuki, J. and M. Ito (1973): A new magnesium carbonate hydrate mineral, Mg5(CO3)4(OH)2•8H2O,from Yoshikawa, Aichi Prefecture, Japan. J. Japan. Assoc. Mineral. Petrol. Econ. Geol. 68, 353–361. Canterford, J.H., Tsambourakis, G. and Lambert, B. 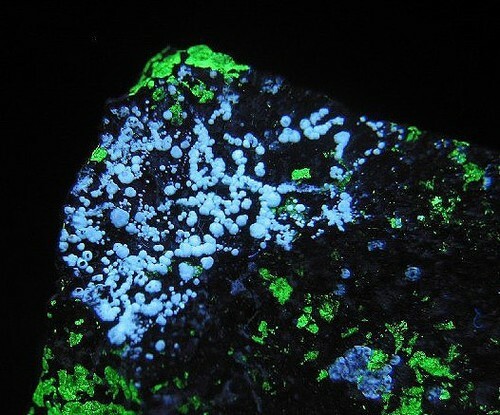 (1984): Some observations on the properties of dypingite, Mg5(CO3)4(OH)2•5H2O and related minerals. Mineral. Mag., 48, 437–442. Niedermayr, G., Praetzel, I. (1995): Mineralien Kärntens. Naturwiss. Verein für Kärnten, 1995, 232p. Greengrass, K., Last, W. M., Deleqiat, J., & Suklmn, S. (1999). Waldsea lake Revisited: Another look at the Recent History of One of Western Canada's Best-studied Meromictic lakes. Bender, D. and Krimmelbein, W. (1994) Aktuelle Übersicht: Mineralien der Zinkhütte Genna/Sauerland. Stand Juni 1994. Mineralien-Welt, 4/94, 10.; Blaß, G. & Graf, H.W. (1994) Neufunde von bekannten Fundorten (9). Mineralien-Welt, 5 (1), 18-21. Szakáll & Gatter: Hun. Min.Spec., 1993; Sánoor Szakáll, Mária Foldvári, Gábor Papp, Péter Kovács-pálffy, Árpád Kovács (1997) Secondary Sulphate Minerals From Hungary. Acta Mineralogica-petrographica, Szeged, Xxxviii, Supplementum, 7-63.
ⓘ Mt. Ramazzo Mine ? Pane, V., Brizio, P., Bittarello, E., Marengo, A., Rossetti, P., Ciriotti, M.E. (2018) Dypingite: nuovo minerale idrato di Traversella e studi comparati con carbonati di magnesio della Sezione Salvere dell'ex miniera di Brosso. Micro, 16, 2-2018, 54-69. Campostrini, I. (2001): Le miniere di Brosso. Monografie XXIX. Museo Regionale di Scienze Naturali, Ed., Torino, 185 pp. ; Pane, V., Brizio, P., Bittarello, E., Marengo, A., Rossetti, P., Ciriotti, M.E. (2018) Dypingite: nuovo minerale idrato di Traversella e studi comparati con carbonati di magnesio della Sezione Salvere dell'ex miniera di Brosso. Micro, 16, 2-2018, 54-69. Biagioni, C., Orlandi, P., Cerri, M., Pistolesi, M., Rapaccini, S. & Santucci, A. (2013). Temperino e Lanzi. Le paragenesi secondarie dello skarn. Rivista Mineralogica Italiana, 1/2013, 40-55. Pemberton, H. Earl (1983), Minerals of California; Van Nostrand Reinholt Press: 199, 201. Cobban et al., 1997, Minerals of Colorado.